A unique exhibition, the first in Australia, will explore the grand historical sweep of Chinese art and calligraphy traditions at the National Museum of Australia (NMA) starting on Friday. The exhibition, namely The Historical Expression of Chinese Art: Calligraphy and Painting from the National Museum of China (NMC), consists of more than 100 objects from China. 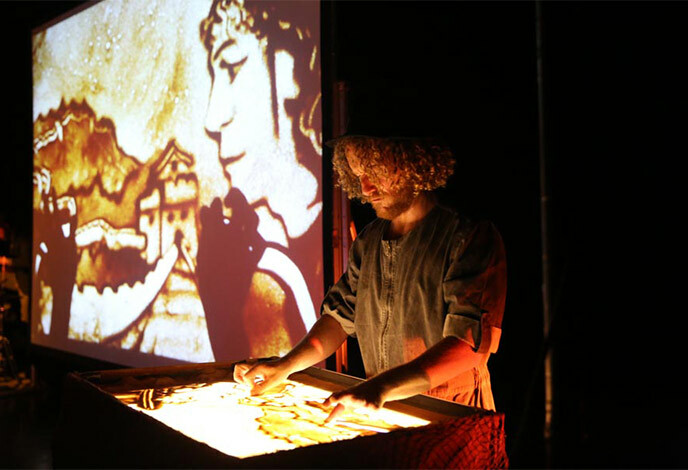 It features an animated digital experience that brings historical figures to life in intricate moving detail. "This exhibition goes to works of art. 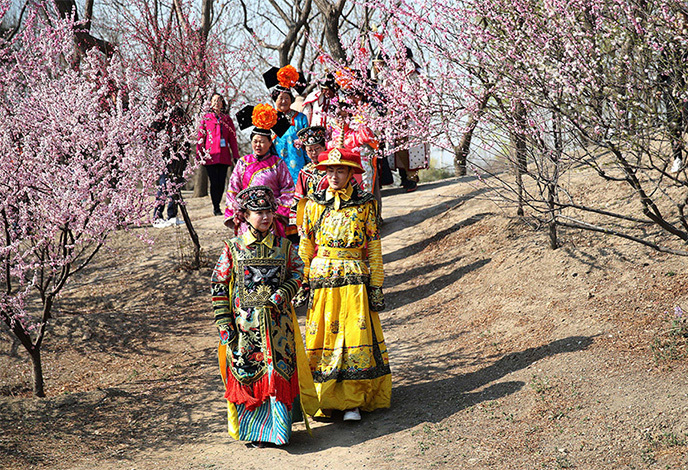 It goes to the heart of Chinese culture. What can you have when you try to speak to the long history of the Chinese people?" said Mathew Trinca, director of NMA. "(Calligraphy and ink painting) are not only able to tell us about the nature of Chinese art, but the broad society as well." Shan Wei, deputy director of NMC, said that calligraphy and ink painting have a long history in Chinese culture. "Through this exhibition, we hope to share with the Australian audience the artistic interpretation of Chinese painting and calligraphy on history and life, the aesthetic concept contained in it, the spiritual pursuit embodied in it, and the philosophy of life of Taoism and nature." A highlight of the exhibition is a rare 20-meter-long replica of the first scroll of Emperor Qianlong's Southern Inspection Tour. The original painting, completed in the mid 18th century, consisted of 12 scrolls with the total length exceeding 150 meters. Emperor Qianlong was one of the most influential emperors in Chinese history. "To help Australian audiences understand the scroll and Chinese culture, we also brought our digital animation, which, with vivid details of architecture and figures, will show our audiences the grand royal parade of Chinese emperor as well as the scenes of prosperous Chinese society," Shan said. The exhibition also brought together works from three Chinese contemporary artists Wang Naizhuang, Xie Yun and Xiao Lang. Liu Gang, director of the Institute of Painting and Calligraphy of NMC, told Xinhua that calligrapher Xie Yun's works explored the traditional style of Chinese calligraphy over 2,000 years ago, while Wang Naizhuang, known for the combination of Western and Chinese painting techniques, pushes the boundaries of traditional ink painting. Heavily influenced by art works of the Ming (from mid-14th century to mid-17th century) and Qing (from mid-17th century to early 20th century) dynasties, celebrated bird-and-flower painter Xiao Lang incorporates traditional forms of calligraphy into paintings with a strong focus on nature. The third part of the exhibition is a scroll from NMA's own collection exploring the strong Chinese-Australian connection, Harvest of Endurance Scroll. The scroll is an artistic representation of two centuries of Chinese contact with and migration to Australia. A total of eight meters of the 50-meter scroll will be on display. "It shows the history of Chinese people in Australia," said Michael Pickering, senior curator of NMA. " This painting basically marks the period of time in the 1970s and 1980s when they were at the transition from Chinese engagement through individual immigration to a time when political recognition raised the profile." NMA signed a memorandum of understanding with NMC in 2011. Last July, a 150-piece "Old Masters" art exhibition with Australian indigenous artists opened in NMC. Shan Wei, who had not started his work in NMC then, went to the exhibition twice as a visitor. According to Yang Zhi, minister-counselor for culture at the Chinese Embassy in Australia, told Xinhua that the preparation for the exchange exhibitions took almost three years. 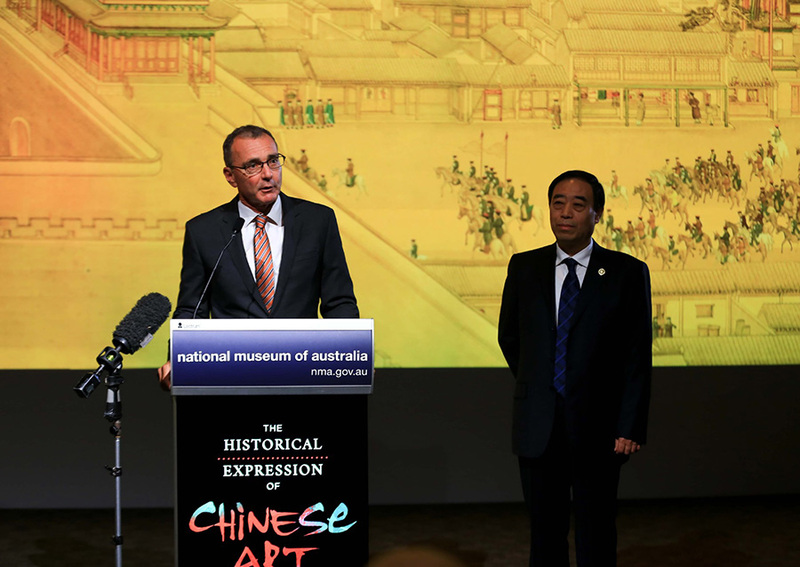 "These exhibitions brought the cultural exchanges of China and Australia to a new height," he said. "In recent years many Australian culture institutes visited China, and vice versa. Such exchanges shortened the distance between our two peoples, and enhanced mutual understanding." The exhibition will run until July 28.